The Maryland Food Collective Celebrates 43 years! 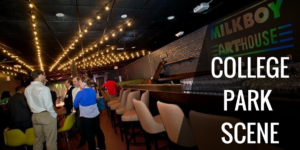 The University of Maryland Food Collective, also known as the Co-op, celebrates 43 years of food, music, and good times! Residing in the basement of Adele H. Stamp Student Union, the Maryland Co-op has been collectively owned and cooperatively managed since 1975. 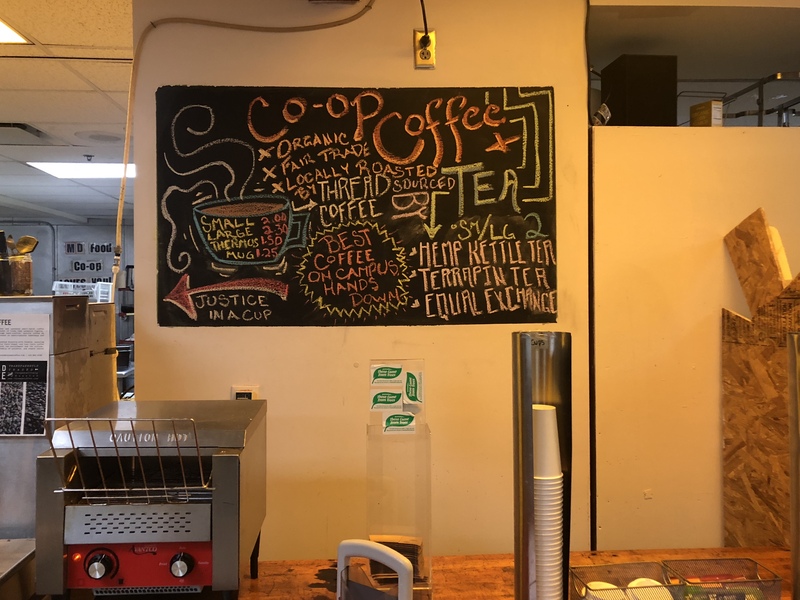 This eatery is a worker owned food cooperative which started as an initiative to increase the affordability of healthy food options on the University campus. Much of the Co-op is run by volunteers, and the management/worker organization is based off an “equal pay equal responsibility” system. Every worker has the same pay and therefore has and same responsibly and power within the restaurant. 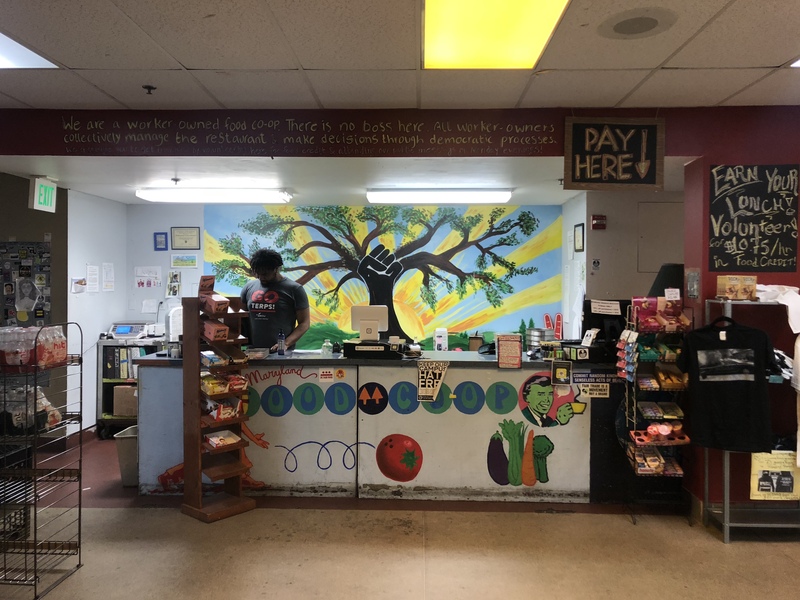 Team members follow a decision making process in which all workers are in the same level of management, which allows the Co-op to provide both healthy and affordable meals. Most of the profit made by the Food Collective is put back into the eatery, ensuring high quality foods and fresh ingredients. They hold public meetings every Monday evening to gather input from customers and local community members. The Co-op also follows various other values such as environmental and human health. In fact, they give a 10% discount to customers who bring their own containers and cutlery to promote sustainable living. They are also big believers in animal ethics, and arrange a wide selection of vegan and vegetarian meals. They make sure to have tons of options for those with dietary restrictions, accommodating customers with gluten, nut, and other allergies. They urge customers to let workers know of any allergies and restrictions and do all they can to customize orders as per requirements. 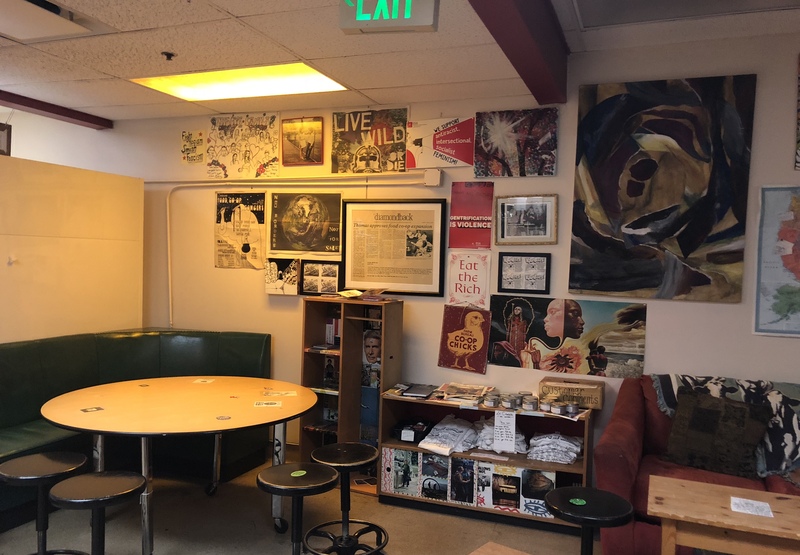 The Co-op’s interior is homey and original, flooded with authentic artwork created by students over the years. The restaurant hosts various events throughout the year including yoga, meditation, music, and more. These are popular amongst the crowd, and the Food Collective is a common spot where people like to spend their free time and hang out. Their efforts towards a better and healthier community, as well as their wide selection of food options is sure to please any customer.